February is the absolute worst month to have a birthday in, particularly when you live somewhere that experiences harsh winters. This month I’ve had 4 midterm exams, 2 papers due, and 1 quiz… along with actually leaving my house and going to school in -40 degree weather. This also means I’ve always hated having my birthday in February. Anyways, enough complaining… I turned 21 on February 23rd! I’ve always wished my birthday was in the summer so I could throw some extravagant outdoor barbecue party, but I guess I just have to keep dreaming… Unless of course I move somewhere that’s warm in February. Turning 21 in Canada isn’t anything special. I’ve already had my “sweet 16”, I became an “adult” when I turned 18, and I could start buying alcohol and going out to bars at 19… so yeah, 21, not really that great. So really all that’s important to me is seeing the people I care about and having fun! This year my birthday fell on a Monday so that also made things awkward to celebrate. 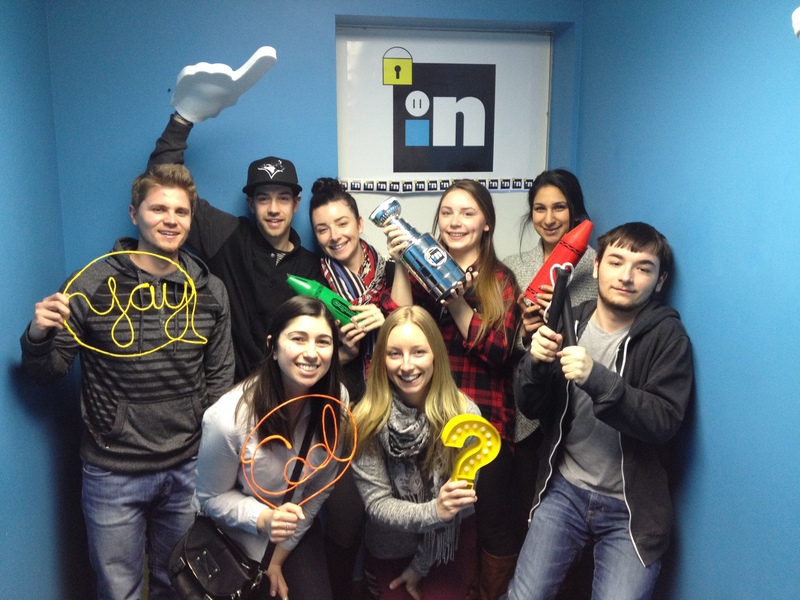 After winning the room escape! So, the Friday before my birthday I went to the movies to see the DUFF with a few friends! Boy am I glad I did… that movie was freaking hilarious. Then on Sunday we went to something called a “room escape” where you’re essentially locked in a room for 45 minutes and you have to solve puzzles and find clues that will lead you to the key to escape. Both of my sisters and their boyfriends, my brother, and two of my bestfriends came to play and it was seriously the funniest thing ever. Somehow we all came out alive with 5 minutes to spare. Then we grabbed Starbucks and went back to my house where my sister and my mom made homemade spaghetti and meatballs for dinner! Then cake, presents, and the Academy Awards! On Monday, my actual birthday, I went out for sushi with my bestfriend and her boyfriend and slept over at her house downtown. I had school at 8am the next morning, but I go to school in downtown Toronto where she lives so it was a lot more convenient than my normal subway commute. And that was that!! 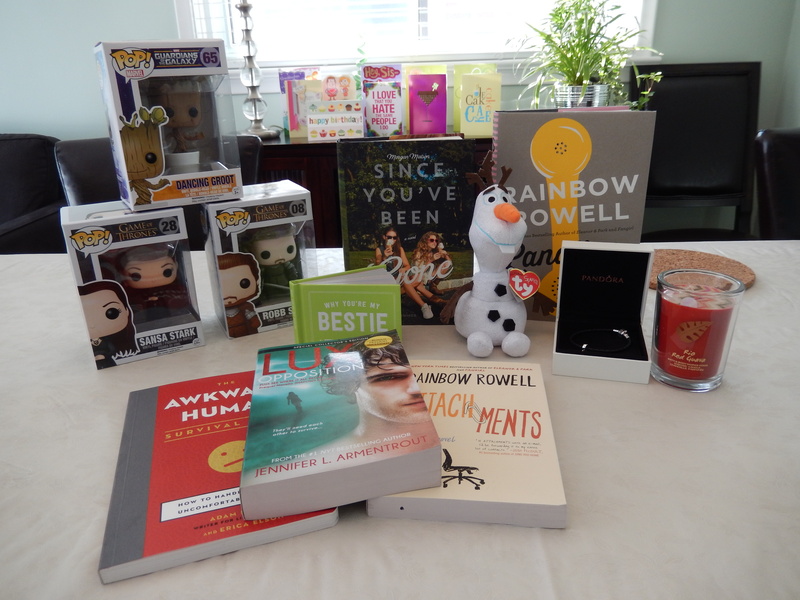 All in all it was a pretty wicked birthday, but now what you’ve all been waiting for… the book/other fun stuff haul! I don’t order from BookOutlet a lot because most of the time I end up putting a bunch of books in my cart that I don’t even think I would end up getting around to I just do it because they are good priced… BUT. When I saw Attachments and Landline AND Since You’ve Been Gone on the website I just had to make an order. Then of course my mom paid for them and I had to pretend it was a surprise… haha. I also ordered Opposition from BookOutlet as well because I read the first two books on iBooks and intended on getting the rest at some point. The cover is heinous, but whatcha gonna do. Then one of my sisters let her boyfriend pick out all my gifts from them… and so naturally one thing he picked was The Awkward Human Survival Guide. It actually looks hilarious, but the funnier thing was my bestfriend also got me the same book. So hopefully I can return one and pick up something else! My bestfriend also got me that little “Why You’re My Bestie” book and it’s got a bunch of fill in the blanks and stuff inside and she filled it all out for me. My brother got me the Sansa Stark and Robb Stark Vinyl Pop Figures to add to my Stark family collection and the Olaf plush toy that my dog is intent on killing.. My other friend got me the Dancing Baby Groot, which is so friggin cute! Anddd my mom got me a Pandora Charm Bracelet with a 21 charm! That’s it for all my bookish/nerdy birthday goodies! I had such a lovely birthday despite the cold and the abundance of school work. I’ll be back tomorrow with my February Wrap-Up because I’m going to try to squeeze in as much reading as I can today!